.......53 Buddhas and Me .................My Life Adventures.....: "Trees, Trees, Trees"
Well the weather last nice was very very ferocious. The wind was so strong I thought the hotel window was going to explode. Day two started as quite a nice day, there was sunshine and the drive from Warrnambool to Colac was quite enjoyable. 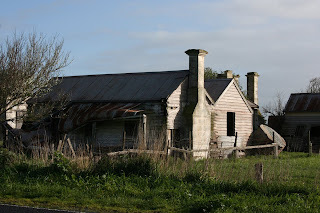 Country Victoria is so beautiful, I just love all the old houses, it makes me think - who has lived there - what was there life like - what happened them??? The weather forecasts had been warning all day of gale force winds / hail / lightning / rain all around the area we are driving. Mmmmmm just the sort of weather you would want to drive under heaps of trees. The Mt Gambier lunch was very enjoyable and then we had to hit the road. As you can see from this photo there were a few things that hit the road and they were all green and leafy. 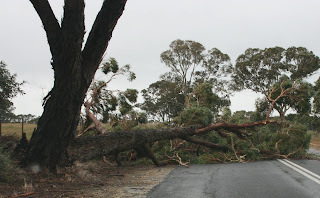 The drive from Mt Gambier to Horsham was literally littered with fallen trees, this one was over the road completely and I almost had to drive into the paddock to get around it. All is well now though and after enjoying a lovely Thai meal with Kristy and Emma I am now in my PJ's and ready for sleeping. Good brief and this fill someone in on helped me alot in my college assignement. Say thank you you seeking your information. "Angel Thursday & Affirmation Boxes"
"Quotes Quotes and more Quotes"